I purchased 6 of these and they've been used for home use as well as commercial use and they've held up beautifully. I've had them for a few years and they still look great, just wipe them down once in a while. Add a functional accent to your entryway with this eclectic leather bench from Strick & Bolton. A plush white leather cushion tops the frame and features button tufting and unique straps that attach it to the birch base. Chromed steel legs complete this contemporary beauty and add a touch of modern shine. Easy to put together and is an attractive piece. It was just what I was looking for to use as an accent piece against a wall that needed a little something else. I also bought the stools that match this bench. My decor is modern so I'm very pleased with the look and also with the quality of this bench.........especially for the price! The color is very close to the picture, but it is not a pure stark white. It's more of an off white. 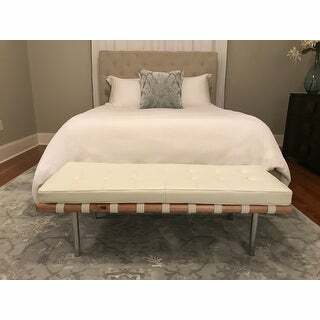 I ordered this bench for extra seating in my daughter's bedroom that has white furniture. I thought the wood/steel would help to update her room to a more contemporary/grown-up look. I was right. The bench is chic and the leather is really nice quality. I purchased this bench for the entrance area and it is PERFECT! it's modern and cute, and looks just right. My friend helped my assemble it, but it was literally 8 screws :) I highly recommend this! This Andulusia bench is almost what I was expecting.... The leather top is a good quality and the faux leather straps do not detract, even though they are a slightly different white. The wood frame in my piece has some darker streaks that I probably would have preferred not be there...but they look natural enough, so I guess I'll just have to get used to them. This bench has a very low profile of 15.5". Measure and make sure you know how it will fit into your planned location. It was a little too low for the foot of my bed, so I took the rollers off of the bed frame to make the bench appear more correctly proportioned to the bed. Also be aware that there is a center seam in the side of the cushion. Again I would have preferred it not be there. This bench is made very well, with durable leather and wood. Assembly was simple, with just having to attach the legs. The look is modern, but the birch wood accent helps it tie into more traditional surroundings. The height of the bench is slightly lower than other benches, which lends to the more modern feel. Overall it is a stylish, quality piece. 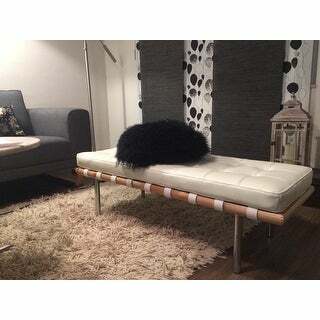 Andalucia Modern White Leather Bench (50 inches long). Shipped within the time frame issued at checkout. Arrived by carrier without any issues. Thanks so much! For the price, the look and quality of this bench are both exceptional. For my purpose, it won't get much use and will simply be a decorative piece, however if being used often, I do believe the white will get dirty easily as the leather quality is clearly not the best (nor would I expect it to be for the price paid). The only complaint I have is that the legs are too short. They should be at least 2 inches taller. Overall, a good purchase for my use and I would recommend it to anyone using it more for decorative purposes than functional purposes. Very good quality! Just a little short. Legs could be 3 inches longer. Beautiful, quality bench. Leather is a creamy white. Lower to the ground. I'm placing it in a big modern closet for putting on shoes etc. Nice light wood frame. Stylish and modern. Recommend it highly. great bench for the price. modern and sleek. too short for a dining room table but perfect for end of bed or foyer. Love it!!! Excellent materials and tons of style! We are using it as a coffee table and it is the perfect height to put your feet up. I wish there was a matching sectional! Thanks Overstock! bench arrived quickly, well packed and was easy to assemble. However--the white leather really looked like vinyl that was stored for 50 years and was yellowed and dingy, the wood corners of the base looked like a beginner had used a dull saw to create the miter. The wood finish was really poorly done, at most one layer of varnish on an improperly sanded surface. We were extremely disappointed and sent it back immediately. Came very quickly.Beautiful leather! Was apprehensive about the Polyurethane coated leather, thought it might make it too shiny and smelly.Not at all, can't even tell it's on there. The seat is a little lower than I prefer, but it is beautiful.Went together very easily. just want it for extra seating and part-time ottoman. Thanks Overstock for another great priced, high quality product! My husband put this bench together within 20 minutes. The height is perfect for the end of my low profile bed. The color is definitely off white. I bought this bench on Overstock three yrs. ago. The bonded leather is cracking all over the place. the buttons are not in place, the leather cover and metal piece underneath are not in place. Great bench and it is easy to assembled! Beautiful piece with high-quality white leather. Super easy to assemble, just screw on the legs. The only issue I have is that it is a little short for me. Nice quality bench, great wood and nice quality leather bench. Perfect for entryway for my guests to remove their shoes and put groceries or bags on. Great for home use, mine has held up years. Be careful when you sit too far to one side, this thing will tip over! Lightweight and stylish, easy to clean. I've bought 5 of these for my business and absolutely love them. They handle wear and tear very well and the color stays bright even in bright sunlight. It's exactly what I needed! at the foot of my bed, looks rich. "You once offered corresponding white ottomons... I can't find them now: Any chance they will be available again?" "I own the 50" bench and love it! You used to sell corresponding ottomons (in white), but I can't find them currently; any chance you will restock and offer them again?" "what is the weight limit for this bench?" "We got this bench and it just arrived today, it looks great. The only thing is that the legs are too short. We need a 14 inches legs. Is there an extension or a taller leg to be purchased?" "How much does it weight?" This item weighs approximately 28 lbs. "Do you have assembly instructions or a picture of how the legs attach?" There are instructions included and it is very easy to assemble. "what all did mention how why how long"
The dimensions are approximately 50 in. L x 18 in. D x 15 in. 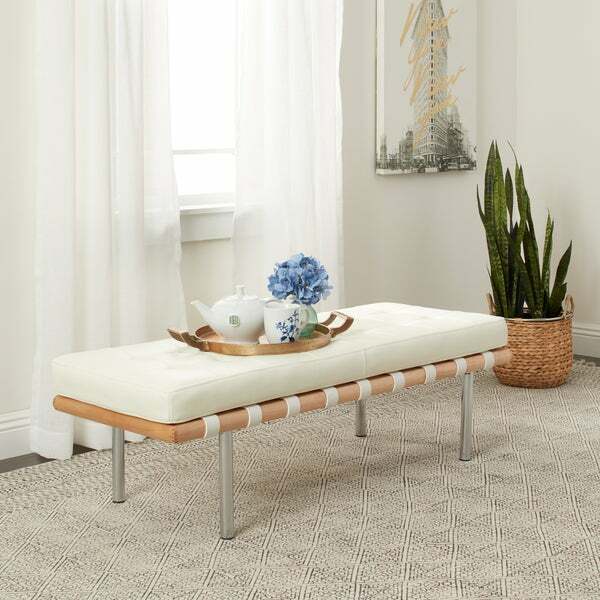 H.
Safavieh Amalia Bench -White / Natural - 47" x 16" x 18"